A bunch ‘o good and fun news! I’m happy to say, this Weekly Update is mostly good news! 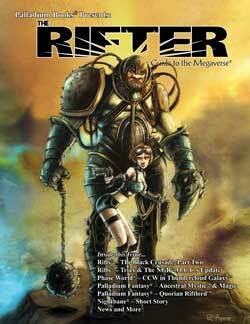 UPDATE: The Rifter® #55 ships next Monday. It is another fantastic issue you will not want to miss. 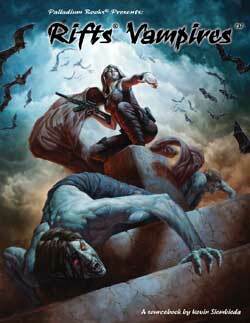 UPDATE: Rifts® Vampire Kingdoms™ goes to the printer Monday! Wayne starts laying the book out tomorrow as I complete some final tweaks of the last two sections of the book. 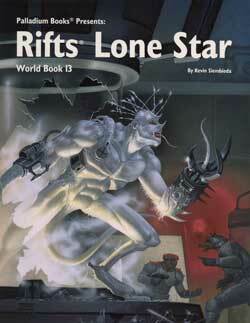 We will work through the weekend to make sure Rifts® Vampire Kingdoms™ goes to the printer on Monday! See the new description elsewhere in this Update. 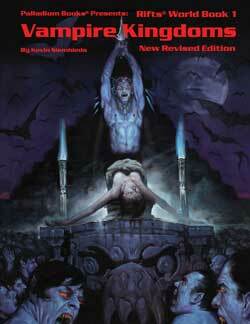 We think Rifts® Vampire Kingdoms™ is an amazing new product. I listened to the fans and tried to include as much of what they wanted to see in this book as possible. We think the Vampire Hunter O.C.C.s are awesome. The vampires are awesome. The vampire player characters are cool. The detail about vampires is comprehensive, including new information on their powers, weaknesses, protectors, lairs and where they sleep. The new monsters are fun. The data about Mexico and the Vampire Kingdoms is greatly expanded. The section on Towns alone is something like 20 pages! Just about everything is completely rewritten. If most people don’t love this book, I’ll ask to be staked through the heart. Place your orders today. FREE Rifts® Vampire Kingdoms™ Sneak Preview available now from DriveThruRPG.com. The preview was made available Tuesday afternoon. Check it out. Remember, it is just a taste of what’s in the book. There is so much more. UPDATE: DriveThruRPG.com Christmas in July Sale – July 25 – August 1: Starting Monday, Palladium Books PDF titles and other publishers will be at a discount. Offer ends Monday, August 1, 2011 (10am EST). 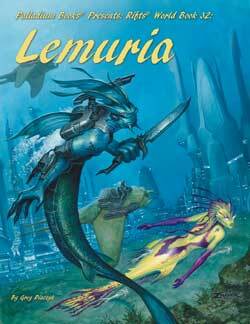 UPDATE: Rifts® Lemuria goes into full final production next week. The last of the artwork is coming in and looks fabulous. I start on the rewrites and final editing Monday. We’re still shooting to get it to the printer before Gen Con. This book is worth it for the Biomancy material alone. The characters and new magic, power and gear are written in such a way that much of it will be easy to incorporate into existing campaigns without going underwater. UPDATE: Online sales. Not all the news is good. Sales remain up and down and overall weak. With the release of The Rifter® #55 next week and Rifts® Vampire Kingdoms™ a couple weeks later, we should see a nice bounce in sales. And a whole lot more new books are being created even as you read this. 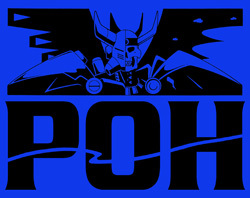 UPDATE: Robotech® New Generation™ Sourcebook. In production. Should ship September. 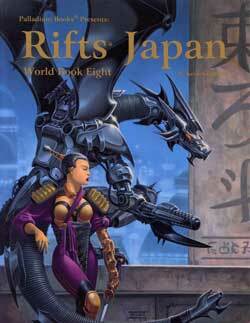 Rifts® Vampires Sourcebook™ and Megaverse® in Flames follow it. BIG NEWS: Alex and family move back home this weekend. The inspections went well and the family is excited to be moving home. If I didn’t have a million things to do before Gen Con Indy, I’d throw a party. The place looks beautiful and the family is anxious to get their lives back to normal. Congratulations! Alex’s health is not as rosy a picture. Improvement is slow and his emotions are raw. Alex and I are trying to stay positive, but it’s difficult. We all wish he’d start seeing dramatic improvement. Hopefully, being able to move back home will help. UPDATE: Back in Print: The plan is to bring several titles back into print, including Mutant Underground™ for Heroes Unlimited™, Xiticix Invasion™ for Rifts® and the out of print titles in the Coalition Wars® series over the next month or two. Maybe even in time for Gen Con. New projects are moving along nicely. QueenofGhouls.com – She’s working away on more cool stuff. Check it out in her online store. Kathy continues to whip up new creations with more life size Halloween props going up this weekend. The Queen of Ghouls has plans for more zombies, skeleton pirates, wizards, werewolves and monsters in the weeks to come. Halloween is creeping up fast. UPDATE: Palladium Open House is May 4-6, 2012. Admission tickets are available now. So are tickets for VIP Thursday, May 3, 2012. This might be our last Open House so plan on coming. We hope to see as many fans as possible. Remember, VIP Thursday tickets are limited to around 60 people and always sell fast. Likewise, based on chatter, it sounds like a lot of people are planning to attend, but we have to stop taking admissions at 300 people. Wait too long and you might not get in. Tell everyone Palladium will be at Gen Con Indy. Amy Ashbaugh (artist; she’s in the Art Show which is across from the Palladium booth), and maybe others. 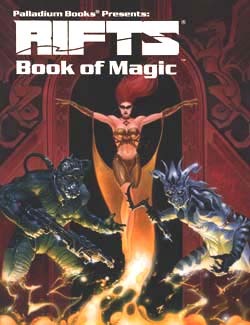 Brandon Aten plans to run a Rifts® Triax game and Zachary Houghton and Lonnie Langston want to run demos of Palladium games. Join the fun. Stop by to say hello, get books autographed, and buy the latest releases, back stock titles, some out of print books (like Ninja Turtles® RPG titles, Rifts® Ultimate Gold and others), collectibles, original artwork, T-Shirts and other goodies. The guys and I are happy to sign books and chit chat for a little while with everyone who swings by the booth, so come on over and join the fun. Give us a helping hand by spreading the word that Palladium Books will be at Gen Con Indy – Palladium Books is Booth 1125. Palladium will attend the Detroit Fanfare, September 24 & 25 at Cobo Hall, downtown Detroit. One of the guests is Kevin Eastman – co-creator of the Teenage Mutant Ninja Turtles®. So this fun comic book and media convention will be a great chance to get your Ninja Turtles® game books (and comics) signed by one of the creators. Other guests include fan boy favorite actor, Bruce Campbell, and dozens and dozens of comic book guests. Palladium fans may be interested to know Dave Dorman (Palladium cover artist), Tim Bradstreet, and pal, Defiler and Palladium contributor of old, William Messner Loebs will also be attending, among many other guests. I’ll keep you posted as we firm up the details. Hype up Palladium Books. Remind people that Palladium’s games use one set of rules, cover almost every genre and offer a true Megaverse® of adventure. Tell ‘em about Dead Reign™, Heroes Unlimited™, Nightbane®, BTS™, Rifts®, Robotech® and all the rest. These days a surprising number of people don’t realize we make games for so many different settings or that there is only ONE game system. Learn one Palladium RPG and you can play them ALL. Let people know that. Let people know that Dead Reign™ is the best Zombie Apocalypse RPG on the market, and it’s awesome. In fact, if you haven’t tried it yourself, you are missing out. I can’t believe how much fun it is to play the game and I co-wrote it! Do it. Be part of a Palladium “grass roots” promotional campaign to bring in new gamers and bring back people who used to play. You do that by talking up the product and memories of past and current fun. Cash flow remains up and down. We need up and up. We need your continued support by purchasing new releases and back stock products. Just as important, you can support Palladium not just by picking up products yourself, but by talking up books you like online and posting links to them in your own posts and websites to the Palladium store. Don’t stop there, talk about them and post links on the Palladium Facebook page, your own Facebook page, etc. Thank you. Don’t forget to place your orders for The Rifter® #55, Rifts® Vampire Kingdoms, Rifts® Lemuria and the 2012 Palladium Open House (especially VIP Thursday). Keep those imaginations burning bright and game on. At the printer. Looks fantastic. Packed with adventure and game ideas for your campaigns. Rifts®: Black Crusade™ Two: Info on the Methodean, their syndicates and secret organizations, history and adventure ideas. $11.95 retail – 96 pages – Cat. No. 155. July 25 release. The Vampire Kingdoms expanded, much new. The Hero Vampire and Deluded Vampire O.C.C.s as player characters. Reid’s Rangers and other heroes. Fort Reid described, all new. Techno-Wizard weapons and other weapons and gear. Much new. The Vampire Kingdoms, vampire society, human cattle and servants. Who can be turned into vampires and who can not. Were-Jaguars and other Werebeasts. Updated and expanded. Camazotz and the Yucatan expanded. Travel through the Vampire Kingdoms and Central America. Ideas for adventure throughout; circa 109 P.A. 192 to 224 pages – $24.95 retail – Cat. No. 802-E. Ships August 10, 2011. Order yours today. 160 pages – $20.95 retail – Cat. No. 885. Final page count and price may be subject to expansion and increase. August 22, 2011.